Congratulations on being accepted as a poster presenter at UKC 2018!! The poster session maximizes your opportunity to interact with conference participants. We look forward to your participation. Set up your poster from 10:00 am to 3:00 pm on Thursday, August 2, 2018. Paper numbers will be placed on the poster boards in numerical order; please find your paper number and put up your poster in the designated space. Presenters who have not placed their poster(s) on their assigned board by 60 minutes prior to the session on the day of their presentation will be considered a “no show” and their manuscript will not be published. Presenters must remove their posters by 10:00 am on Friday, August 3, 2018. 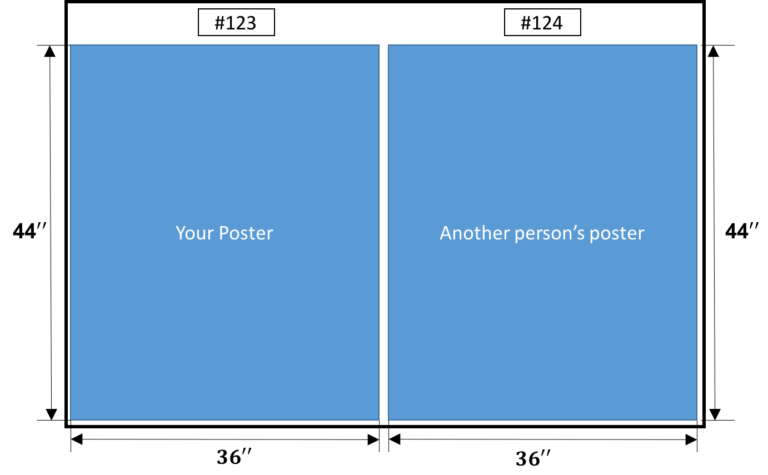 Any posters that are not removed by then will be considered unwanted and will be discarded. 36 inches (W) x 44 inches (H) in a portrait format as illustrated in the figure below. Push pins will be provided to hang your poster. Suggested minimum font sizes are 36-point type for Title, 25-point type for Authors, and 15-point type for double-spaced Text. The entire poster layout should be readable from six to ten feet away.